EFFECTIVE JANUARY 1, 2018 HAZARDOUS WASTE COLLECTION will be available to all residents of Crescent Township. The proper collection of hazardous waste will help eliminate toxins going into our waterways. Please take advantage of this wonderful and FREE service to everyone. Below is a link containing a letter from Waste Management regarding the procedure regarding door pick up service. Stormwater Management is an important part of today's enviroment. We all have an oppurtunity to contribute to cleaner waterways. How can you help? Below is a guide containing some suggestions on how to contribute using your property. Polluted stormwater runoff is commonly transported through Municipal Seperate Storm Systems (MS4s), from which is often discharged untreated into local waterbodies. To prevent harmful pollutants from being washed or dumped into a MS4, operators must obtain a NPDES permit and develop a stormwater management program. The MS4 Program contains elements called Minimum Control Measures (MCM) that when implemented should result in a significant reduction in pollutants discharged into receiving waters. Each MCM requires implementation of Best Management Pratices (BMPs) to meet measurable goals according to an approved schedule. Annual or periodic reports are also required. In development and acativities that may affect stormwater runoff. The following markers have been placed near stormdrains throughout the township. These are reminders to residents that "ONLY RAIN, DOWN THE DRAIN". 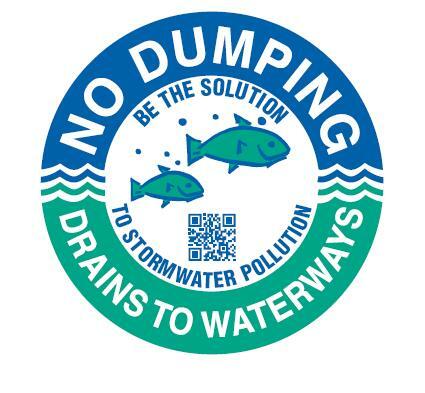 If you notice any items, besides stormwater, being dumped down our drains, complete the following form, ILLICIT DISCHARGE FORM and contact the muncipal office immediately. Keep our waterways clean! Dispose of household hazardous waste used auto fluids (antifreeze, oil, etc. ), and batteries at designated collection or recycling locations. Sweep up yard debris rather than hosing down areas. Properly dispose of excess paints through a household hazardous waste collection program. Sweep up and properly dispose of construction debris like concrete and mortar.